Sachsenring Moto3 and Moto2: Kent vanishes for victory, Simeon steals first win. The German Grand Prix round brought two very exciting support class races, Moto3 stepped outside it’s normal last lap chaos to deliver a getaway performance of excellence from Danny Kent as he saw off all rivals. Danny Kent may have been the pole-sitter but it did not guarantee him a dream start, swamped as the lights changed before fighting back and hitting the front. From that point on the Leopard riders win never looked in doubt as he eased away to win by an impressive 7.5 seconds. The British rider now leads the championship by 66 points from his nearest rival Enea Bastianini. The only rider to attempt to stay with Kent was his team-mate Efren Vazquez, though the Spaniard eventually faded from view too, marking a great day at home for the Kiefer/Leopard team. Gresini’s Bastianini stole third at the line, undoing all Romano Fenati’s hard work to gain the position, leaving his fellow Italian fourth and off the podium for Sky Racing Team VR46. Nico Antonelli was next to take the flag in fifth in a tight finish for Ongetta-Rivacold, with Jorge Navarro top rookie in sixth after his team-mate Fabio Quartararo crashed out. Brad Binder was also in the group fighting for third, though lost out heavily to finish seventh for Red Bull KTM Ajo. Alexis Masbou made massive improvements in the race on his way to eighth after a tough weekend, his team-mate John McPhee was battling down the order for the final points, but just missed out in 17th. Andrea Locatelli was ninth on the other Gresini entry, with Niklas Ajo making up only the places he was deducted to finish where he originally qualified in tenth for RBA Racing. Philipp Oettl (Schedl GP) impressed at home in eleventh, with Jorge Marin the top Mahindra in twelfth. Also in the points were Karel Hanika (Red Bull KTM Ajo) in 13th, Jakub Kornfeil (Drive M7 SIC) in 14th and Jules Danilo (Ongetta-Rivacold) in 15th. Xavier Simeon spoiled the party by smoothly moving into the lead on lap one before Johann Zarco returned to the front to try to pull away. The French Ajo Motorsport rider could not shake off the Belgian, who always seemed to have an answer with great pace and cornering aboard his Federal Oil Gresini. Franco Morbidelli had impressed in qualifying and stayed with the pace before eventually fading as heroic effort from the injured Tito Rabat alongside Alex Rins charged him down. As the battle for first was settled when Simeon again hit the front over the closing laps, to become the first Belgian to win since 1983, and Zarco content to finish and secure more championship points in a strong second, the drama unfolded behind. It was to be Alex Rins who would take third after wisely sitting back from the warring Morbidelli and Rabat, the Pons man clear of danger as The Italians Italtrans bike slipped away collecting Rabat’s EG,0,0 Marc VDS machine in the process. Rabat’s fall improved Zarco’s lead in the title hunt by 20 points, leaving him 65 points clear in the standings. Simone Corsi was also suddenly in fourth, improving his result for Forward as he celebrated his 200thGP start. Sam Lowes had battled to the front of the chasing group to lead it and fifth was a good finish to a tricky weekend for the Brit and the Speed Up team. Tom Luthi (Derendinger Racing Interwetten) had long lead that charge before being passed to leave him sixth, with Taka Nakagami (Idemitsu Honda Team Asia) just behind in seventh. Lorenzo Baldassarri took the flag in eighth for Forward with Julian Simon ninth on the QMMF Speed Up, 2014 winner Dominique Aegerter ( Technomag Racing Interwetten) just slid his Kalex into the top ten. Also collecting points were top German Sandro Cortsese ( Dynavolt Intact GP) in 11th, Mika Kallio (Italtrans) in 12th, Randy Krummenacher (JIR) in 13th and Jonas Folger who was slowed by an earlier run off track in 14thfor AGR Team. 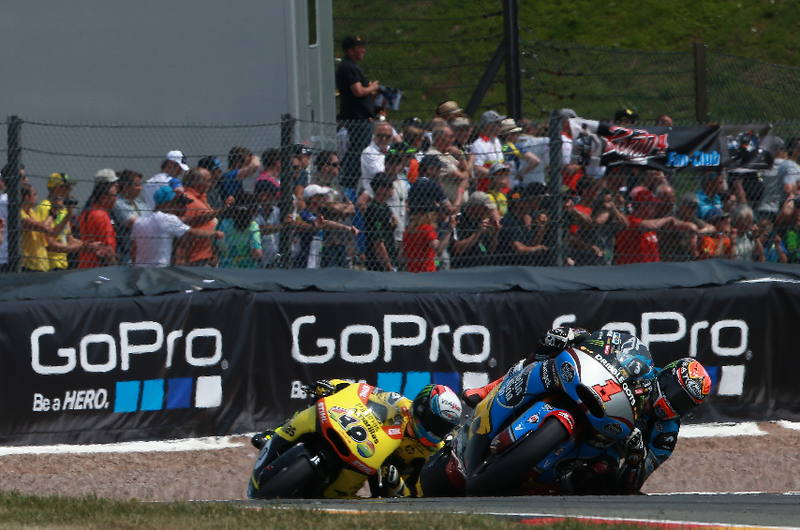 Folger’s team-mate Axel Pons secured the final point on offer in 15th. What we learned: A lead is important before the summer break. It was the talk of the paddock in all classes, especially as ‘silly season’ approaches in the Moto3 and Moto2 classes, but those riders who went into the summer break were really happy to shout about it. Both Danny Kent ( dominant) and Johann Zarco (settling for points) will return to the championship with very similar leads – 66 ahead for the Brit and 65 ahead for Frenchman Zarco – and the confidence the cushion of over two race wins in points gives them is immense, looking easy with their decisions over the race weekend and particularly in the race. The effect carries on to those who did well in the final race before with Simeon brimming with confidence after notching up his first win. Bring on the second half of term. Previous Previous post: Sachsenring Moto3 & Moto2 round-up : Kent and Zarco in a class of their own for poles in Germany as race direction dish out the penalties!